With the world moving towards online from offline and towards mobile from desktop, it becomes extremely important for a business to have a significant presence on mobile devices. With the world moving towards online from offline and towards mobile from desktop, it becomes extremely important for a business to have a significant presence on mobile devices. Providing App Store Optimization Services in Delhi, DigitalOye has field experts, with decades of experience, coming together to offer the best for your brand when it comes to mobile devices. App Store Optimization is the process which helps in increasing the visibility of your app on various app stores. The greater visibility/reach on the app store in turn has a positive impact on app downloads, ultimately converting to transactions. At DigitalOye, we improve your app store rankings for better organic search visibility, thus giving you an edge over your competitors. The better your app ranks in search results on app stores across platforms, the better are your chances of getting good quality leads. The magic lies in organically reaching more people on the app store and as the top ASO Company in India, we invest our time and resources to do just that for you. Organic app downloads have more retention rates and less uninstallations. We use various methodologies and tools to figure out the industry standards. We focus on data sets to derive the right roadmap for you. Our teams conduct regular A/B testing and draft daily reports to be able to chart the right growth path for your app. We analysis user interests and user behaviour to show relevant and targeted search results on app stores, leading to more app downloads. 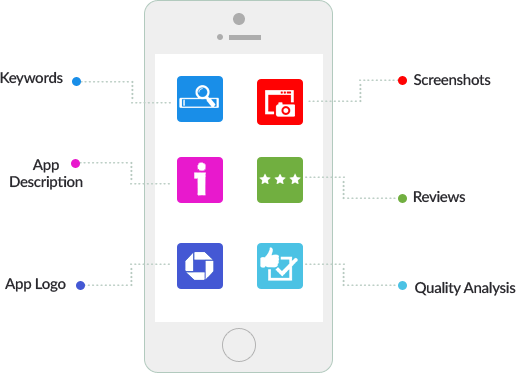 We increase your marketplace visibility by optimizing your app and app store content for keywords, images, local relevance and other such factors. As an important App Store Optimization strategy, we optimize your app keywords for specific audience sets and markets/places, thus localizing it for better rankings. User reviews & ratings are an important factor for consideration by any customer, especially for those users who are unfamiliar with the app. Gain users for your app? We utilize our in-house optimization and app promotions techniques to get highly engaged users for your app.